The nominal starting point of St. Olav’s Way at Selånger’s old church, near where St. Olav landed to begin his march to Norway. What is the St. Olavsleden? Or, for English speakers, What is the St. Olav’s Path? or the St. Olav’s Way? Or the St. Olav’s Pilgrimage? I should admit right off that I didn’t know what it was either. Until this year. Now I know enough to know that I’m as determined to do it as I was to do the Camino de Santiago in 2011. Here, in a nutshell, is the bare minimum description of the hike. The St. Olav’s Way starts in Selånger, on the east coast of Sweden, and ends at Nidaros Cathedral in Trondheim, on the west coast of Norway. It follows the road King Olav Haraldsson traveled in the summer of 1030 when he came back from Novgorod in Russia to reclaim the Norwegian throne. The 564 km long pilgrim path runs from coast to coast – through two countries – in the footsteps of St. Olav. Perhaps it’s best to back up a bit and talk about St. Olav. Olav Heraldsson, or Olaf, if you’re going with the Swedish and American spelling, was King of Norway from 1015 to 1028. He was deposed by the Norwegian nobles, and fled to what is now Russia. He raised another army and brought it to the port of Selånger, Sweden, and began his march across Sweden toward Norway. He was killed at the Battle of Stiklestad in Norway. Traditionally, Olav has been seen as the man who Christianized Scandinavia, although some controversy about his motives certainly exists. According to myth, his grave was opened one year after his death, and his body was uncorrupted. Add that to a few stories about his blood curing wounds, and well water he drank from curing disease, and you’ve got yourself a saint. A first view of Norway, just after crossing the border from Sweden. After a little uphill walk, you break into the tundra. At only about 600 meters elevation, you’re getting above the tree line. He was quickly named Patron Saint of Norway by the local bishop, his body was carried to Nidaros, (now Trondheim) and a cathedral was erected on the spot. His local canonization was confirmed in 1164 by Pope Alexander III, making him a universally recognized saint of the Roman Catholic Church. 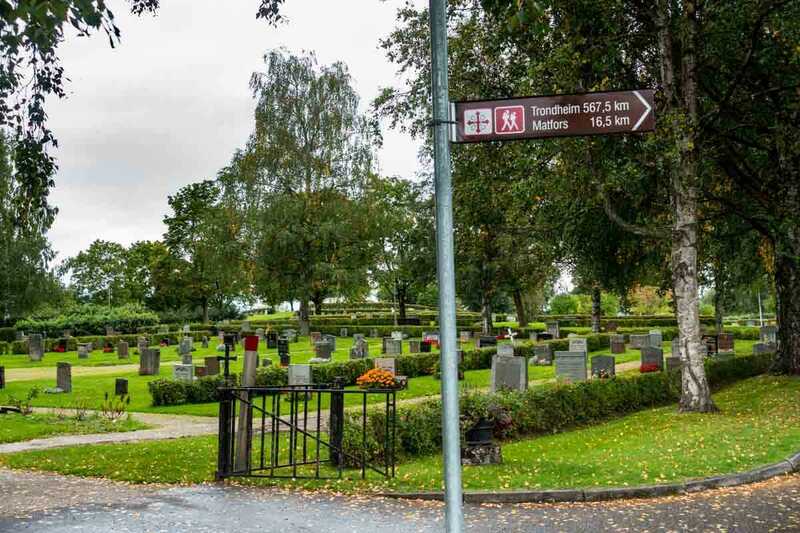 Pilgrimages to the saint’s burial place began almost immediately, but pilgrimages were banned with the advent of the Reformation, and the St. Olav’s Pilgrimage route fell into disuse. I had the privilege to walk selected bits of the St. Olav’s Path in early September of this year. What really made it a joy was hiking chunks of it with Putte Eby, the man in charge of the restoration of the path in Sweden. 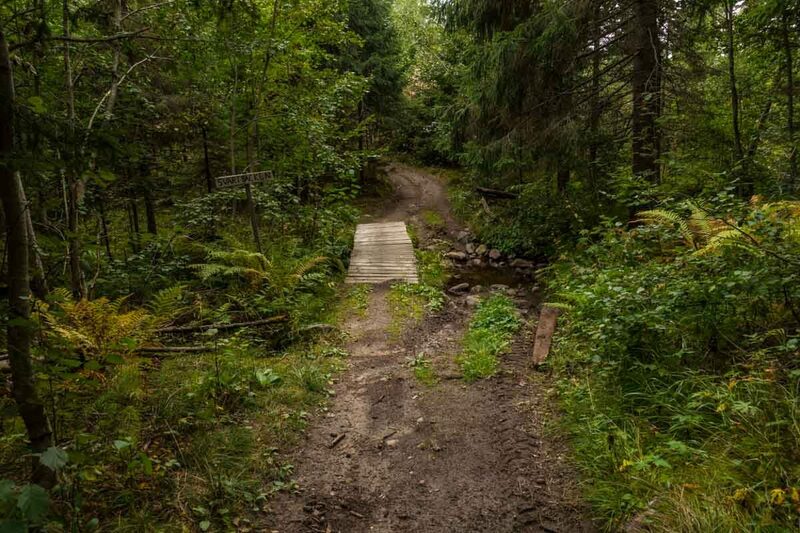 In all, I walked stretches of the path which had been selected by Putte, and was able to sample not only the stunning peace and beauty of the path, but also a cross section of the accommodations available along the way. A not untypical scene on the St. Olav’s Way: a stream, a bridge, in a forest. First, a note about the path itself: it’s beautiful, and completely different from its Spanish counterpart. With a few exceptions, the Camino in Spain is dry as dust, and often hot as hell. Also, Spain is not known for its forests. In contrast, the majority of the ten sections of the St. Olav’s Way I walked were either farm roads that took you from one picturesque Swedish farm tableau to another, or forest paths that varied from barely trampled animal trails to barely maintained old logging roads. All seemed to wind along water in some way. Crossing streams, walking along big lakes, limning rivers to vistas of rapids and waterfalls. In other words, they were all green and moist and accompanied only by the wind in the high pines, the trickle of the brook, the lapping of lake waves, or resounding cataracts. The St. Olav’s Way also differs from the Camino in that there aren’t albergues all along the way that you can just walk into and plop down on a bed. You can, like the Camino, camp if you like. The Swedish law and tradition of Allemansrätten–”every man’s right”–means, within reason, you have the right to hike, and camp, pretty much wherever you like. There are shelters, too, along many parts of the path, although they are completely rustic and, in some spots, badly in need of repair. In other words, bring a tent. 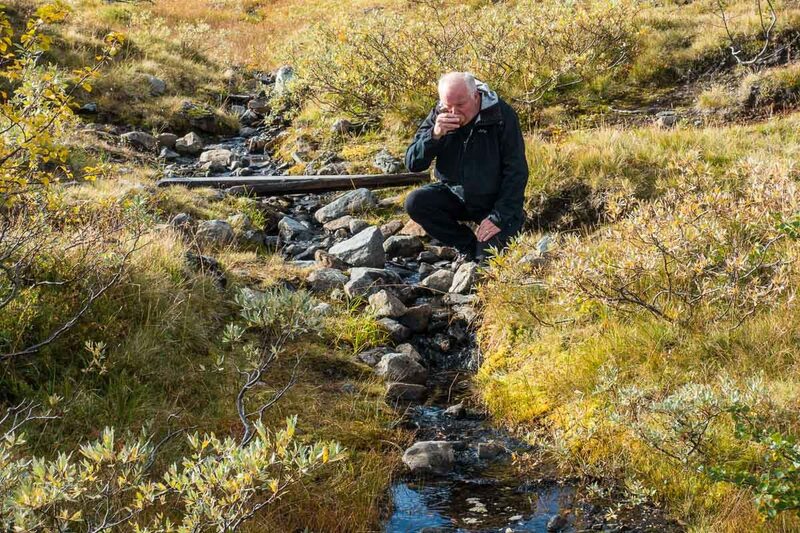 Did I mention the water in most of the streams is drinkable. Putte has a sip. I did, too. It was delicious. But, if you’re like me and prefer your comforts, there are literally hundreds of Scandinavian farmers and other residents along the St. Olav’s Way who have opened up rooms in their homes or out buildings and converted them into comfortable mini dorms where you can stay, probably get a shower, and, for a little bit more, even a hearty Swedish breakfast and their famous strong coffee. Be aware, of course, that this is Sweden and Norway, and you’ll be paying Scandinavian prices for your accommodations. One of the places I stayed was the equivalent of about $20 USD for a bed in a room with six beds, and a shower across the yard. Another more luxe option was a place like Brunkulla Gård. It cost the equivalent of $160 USD, but had ensuite bath and a sauna down the hill by the lake. Also included was a spectacular breakfast of eggs, meats, cheeses, breads and jams, all made on the farm. I stayed there the first night. Absolutely first rate. I especially liked the tour of the farm from Niklas and Camilla. My hosts the first night along St. Olav’s Way. Niklas and Camilla. 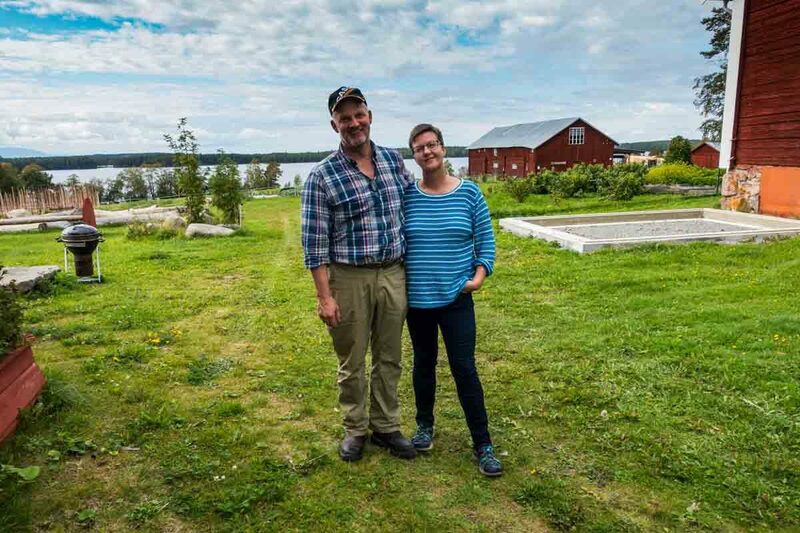 Their farm, Brunkulla Gård, has been in Niklas’s family for more than 500 years. The only hitch is you’ll have to call ahead for accommodations. Some spots have websites or email addresses you can use to make your arrangements. You can download the list, which is being constantly updated, at this link. You’ll have to download the map that accompanies it and match the accommodations to the map as you go. Please be sure you get the latest version before you go. It would be an improvement if the list included price ranges. It does not currently. I should also note that the St. Olav’s Way can be done on bike or horseback. The routes are a bit different, of course, but you end up in the same place. Those maps are also available at the same link as above. Disclaimer: I was hosted for my accommodations by Adventure Sweden, the city of Östersund, Sweden, and several lodgings along the way. Two of those were hotels that deserve special mention: The Clarion Hotel Grand in Östersund, which features a restaurant conceived by the Michelin winning chef Marcus Samuelsson, and the Copperhill Lodge in Åre, where we stayed in our earlier visit to the region, and also features spectacular food to go with spectacular views. Worth mentioning, of course, is that this is a long hike. Although I never did more than 12 kilometers (7.5 miles) in a day, I still was very protective of my feet. This is the first longer trek I’ve made with my Oboz Sawtooth model shoes. The feature that sold me on Oboz hiking shoes in the first place is that they come in wide widths. But they also have a great insole, and they are the most comfortable shoes I’ve ever owned. I also have a pair of Oboz Bridger model waterproof shoes. If I were doing this again, I’d be tempted to bring both pairs, as there are some soggy bits on the path. You can see more discussion of hiking footwear here. Disclosure: I received a pair of shoes from Oboz and a few pairs of socks from Point 6 to test. They wanted my honest evaluation, and here it is: I love them both. Sounds like a great path. Will have to say that the Camino Primitivo is considerably greener than the Camino Frances – possibly not unlike the Olav Way. Ann, it’s certainly much prettier than the Camino Frances, it a lot more pleasant walking mostly in shade rather than the broiling Spanish sun. I do want to get together again some day and hear about the Camino Primitivo. This sounds like my kind of pilgrimage route. I have a fantasy about walking the Camino de Santiago (not shared by Mr. Excitement), but I know I’d be annoyed by walking along highways and I do very poorly in heat—even when I’m just standing still. And, Sweden and Norway remain on our bucket lists. Maybe. Someday. Suzanne, we’ve often mused about walking the Camino again, but after seeing this, I think this is next on our list. It is just so much more pleasant walking. It doesn’t have quite the religious aspect, and there are very few other pilgrims to meet (or bother you) so that’s a consideration. I have always had a fantasy about hiking the Camino de Santiago, but way always worried about the dust and heat. Now this is a very attractive alternative! Covered trail and fresh streams along the way, along with charming stays on farms. Some further investigation is in my future and I thank you for bringing it to my attention! Can’t wait to read more, we were supposed to travel to Sweden this summer, maybe fate intervened and I was just waiting to learn about St. Olavs Way. Alison, it’s well worth getting to Sweden just to do parts of this…and there are a million other reasons, too, of course. The food comes to mind. I don’t see why not. As for heat, I don’t think that will be a problem any time on this route. You will be hiking at about 64 degrees north, which is almost at the Arctic Circle. Be sure to check the weather. May is still Spring, which I’m betting is unpredictable in Sweden.